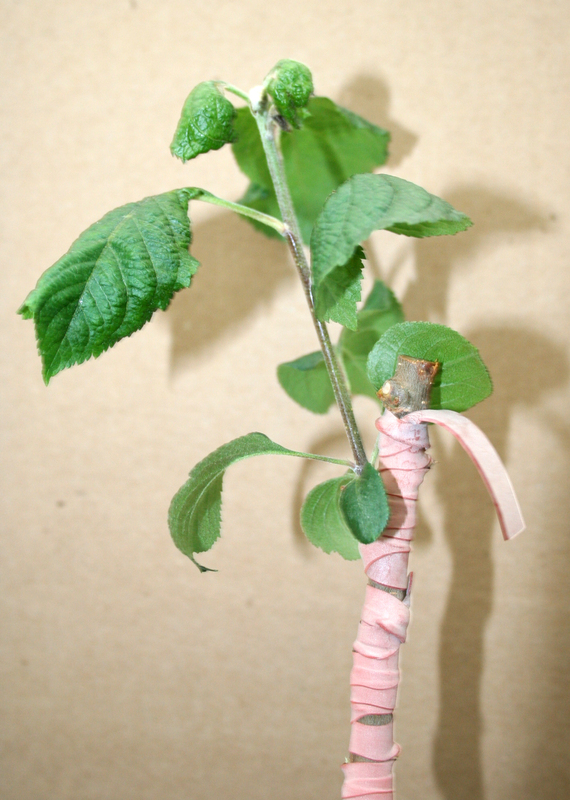 Apple stem grooving virus on indicator host Malus micromalus. 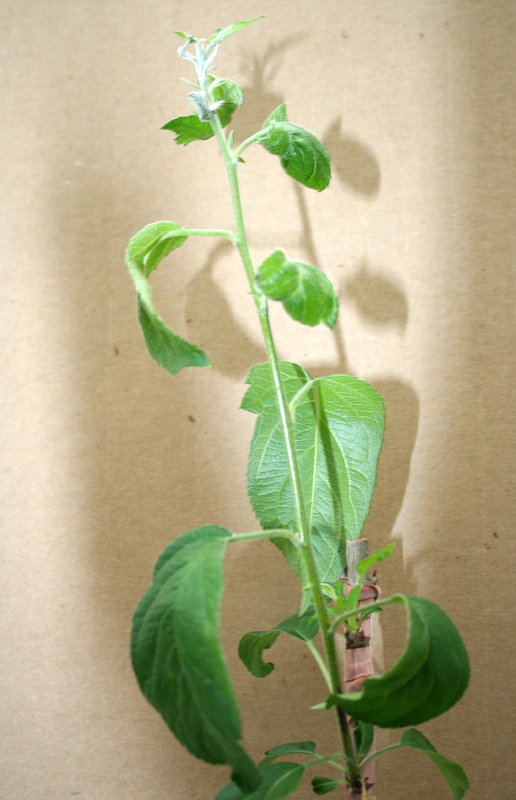 Image from USDA- APHIS Plant Germplasm Quarantine Program. Apple stem pitting virus on indicator host Spy apple. Apple chlorotic leafspot virus. Photo taken at the Sidney quarantine station on indicator cultivar (file labeled Russian Apple). Apple chlorotic leafspot virus on indicator host Russian apple. Cause Three viruses generally considered as "latent" in apple are Apple stem grooving virus (ASGV), Apple stem pitting virus (ASPV), and Apple chlorotic leaf spot virus (ACLSV) all of which are not too important in commercial apple production. 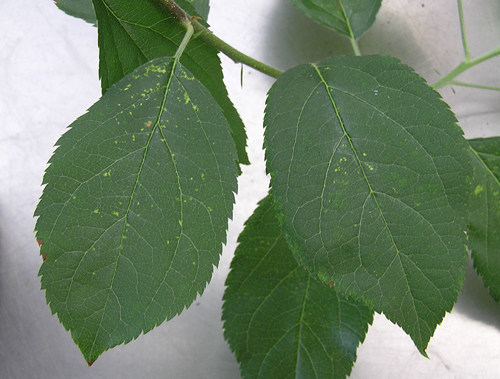 ASGV causes Apple Decline on Virginia crabapple, ASPV causes Apply Spy 227 epinasty and Spy decline while ACLSV causes Apple chlorotic leafspot on many crabapple cultivars (also called Apple top-working disease in Japan). Latent just means these viruses do not cause symptoms on most commercial cultivars, although specific strains of one of these viruses or a combination of them may be associated with diseases such as apple green crinkle disease and apple dead spur. These viruses do not have a natural vector but are graft transmissible. A survey of several important fruit tree nurse-ries in the Willamette Valley of Oregon in 2014 did not detect these 3 latent viruses. 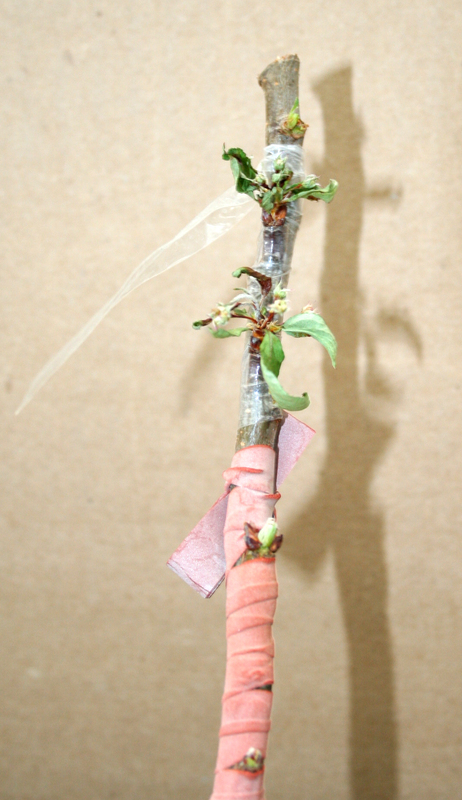 Symptoms Rootstocks of M. sylvestris 'Virginia Crab' respond to Apple stem grooving virus by developing a brown necrotic line at the graft union where complete breakage often occurs. Apple stem pitting virus also causes significant pitting and weakening of 'Virginia Crab' rootstocks. Apple top-working disease in Japan was the result of a hypersensitive reaction of rootstocks (M. prunifolia var. Ringo) to Apple chlorotic leafspot virus in apple scions. The hypersensitive reaction at the graft union resulted in weakened trees with reduced production, and the weak graft unions were very susceptible to wind damage. Some of the new cold-tolerant and fireblight-resistant rootstocks are hypersensitive to one or more of the latent viruses. Cultural control Use only virus-certified propagation material and rootstocks. Zhao, L., Wang, M.R., Cui, Z.H., Chen, L., Volk, G.M., and Wang, Q.C. 2018. Combining Thermotherapy with Cryotherapy for Efficient Eradication of Apple stem grooving virus from Infected In-vitro-cultured Apple Shoots. Plant Disease:1574-1580.